To plump up this delicate skin, dot on a medium-weight eye cream to add moisture that’s missing, then pause – it’s the 60-second rule – let the moisture melt into your skin. Finish with dabs of lightweight foundation. Dot and blend using your third finger. The thinner the skin, the more visible the wrinkles. Try mixing a touch of honey into your eye cream. Pat the cream-honey mixture aggressively around your eye area to help plump up the tissue, especially the outer corner where those cute little laugh lines appear. Let the honey-plus-eye-cream settle in, and then lightly dab off excess before applying any other makeup. 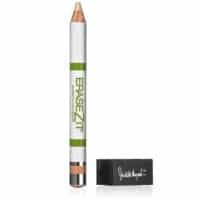 A portable vitamin E stick in your purse means you can “quick fix” makeup lodging itself in the lines under the eye. Take a bit and warm it between your fingers and pat around the eye socket and corner of the eyes returning you to the “honey fresh” look you left home with, in the first place. The interplay of lights and darks is key to cosmetic camouflage. A dark tone “recedes,” a light tone “brings forward.” Color choice is critical. Bit-of-Blush Option: Instead of using a slightly darker concealer – try a dot of powder blush in a dusty rose or pinky orange shade. Apply lightly, directly on the puff or bag. Just whisk it on. It can work wonders! Experiment with this technique, but don’t be heavy-handed. Apply eye gel first and follow with eye cream. 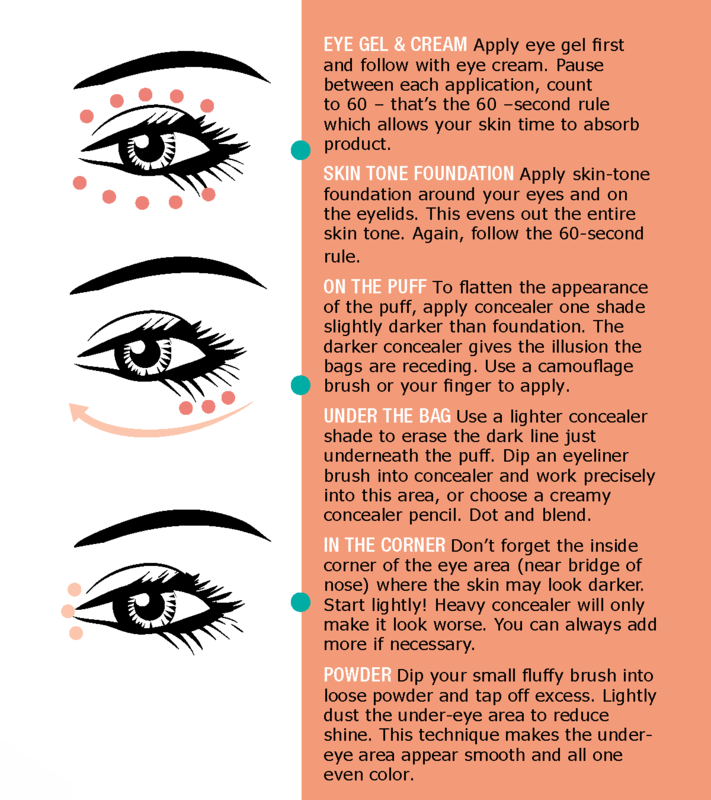 Pause between each application, count to 60 – that’s the 60 –second rule which allows your skin time to absorb product. 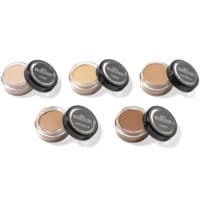 Apply skin-tone foundation around your eyes and on the eyelids. This evens out the entire skin tone. Again, follow the 60-second rule. To flatten the appearance of the puff, apply concealer one shade slightly darker than foundation. The darker concealer gives the illusion the bags are receding. Use a camouflage brush or your finger to apply. Use a lighter concealer shade to erase the dark line just underneath the puff. 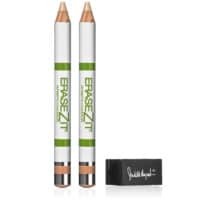 Dip an eyeliner brush into concealer and work precisely into this area, or choose a creamy concealer pencil. Dot and blend. Don’t forget the inside corner of the eye area (near bridge of nose) where the skin may look darker. Start lightly! Heavy concealer will only make it look worse. You can always add more if necessary. 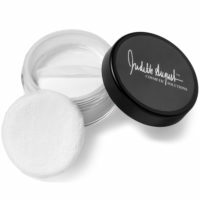 Dip your small fluffy brush into loose powder and tap off excess. 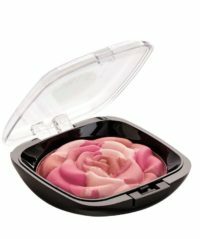 Lightly dust the under-eye area to reduce shine. 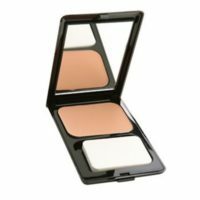 This technique makes the under-eye area appear smooth and all one even color. Quick Trick: Desperate measure for de-puffing: You can resort to the makeup artist’s trick of using a very tiny touch of hemorrhoid cream to temporarily reduce under-eye swelling. CAUTION: Please only do this if you are in a state of desperation. it really works, but shouldn’t be done often. Your eye area thrives on moisture. There are no oil glands under the eyes, which makes the eye area tissue a target for dehydration. I believe everyone needs an eye cream – no matter what. Choose a cream that’s light in texture so it won’t weigh down the delicate tissue. 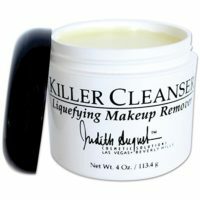 Use your third finger and gently pat the cream around the eye area. Start from the outside corner of your eye and work into the inner corner. Give it a minute to absorb. 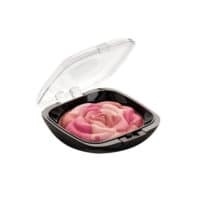 Eye gel for firming – an option. Try applying an eye gel before eye cream. Gel can stimulate the blood circulation, and help relieve water retention – which is a typical cause of puffing. Some gels, if they are light in texture, can be left on for a lifting effect. Others are too heavy and must be removed after a few minutes with warm water. Pat and blend lightly starting at the outside of the eye and move inward. 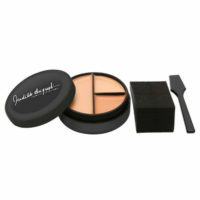 Powder using an eyeshadow brush to reduce shine and to keep concealer in place. The shape of this brush fits perfectly under the eye area. 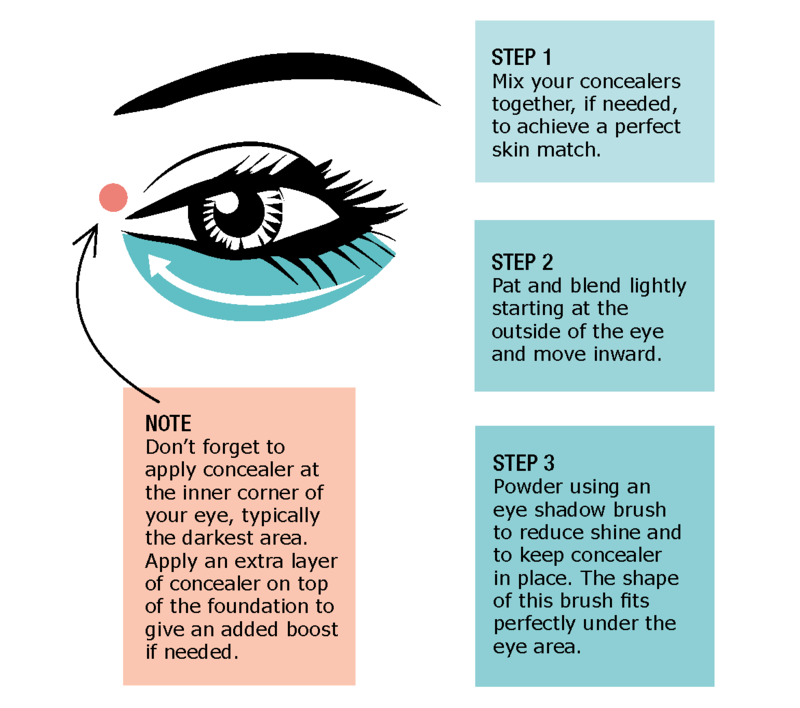 Don’t forget to apply concealer at the inner corner of your eye, typically the darkest area. Apply an extra layer of concealer on top of the foundation to give an added boost if needed. Skin tissue below your eyes is delicate and, like a rubber band, its resilience is very limited. If you stretch and pull at it, this fragile skin will soon look saggy and wrinkled.